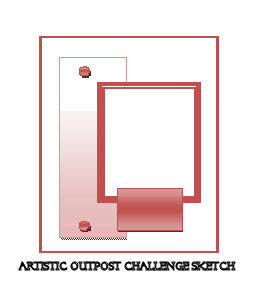 Artistic Outpost is celebrating their 2nd Birthday, and in celebration has issued a PRIZE CHALLENGE. The challenge is pretty simple, just use the sketch shown here and create a Fall or Birthday Themed card using Artistic Outpost images. Once you create you card, head over to the Artistic Outpost Blog and leave your direct link on the Challenge Post - you have until October 23rd to enter. All entries that use the sketch/theme and Artistic Outpost images will be entered into a Random Drawing for a $25 Artistic Outpost Gift Certificate! 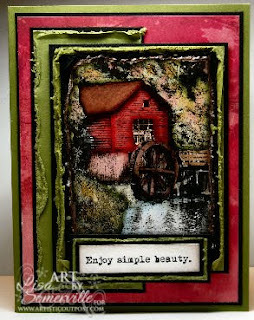 I used images from Old Grist Mill to create my card for this challenge. Stamping the image in Black on Watercolor paper and coloring with the Marker Watercoloring Technique. I also used the Torn Frames Technique to frame my pieces to add to the rusting look of my image. As you can see, I opted to delete the brads from my finished card - use the sketch as inspiration to create your card, you can even rotate it - we'd love to have you play along. Don't forget you can save 15% on all your Artistic Outpost purchases, just use code LS-15OFF when checking out. Remember, you have until October 23rd, to create your Fall/Birthday Themed card using Artistic Outpost images. Comments left here are appreciated, but remember, you have to leave your link on the Artistic Outpost Blog in order to be entered in the drawing! Good Luck! As they say, Great minds! LOL. cool card Lisa! Beautiful card, Lisa! Love the colors and background papers. Fantastic work as always Lisa!! I love the bright bold colors you used. Just beautiful! Love those rich colors and great torn edges.